Figure 1. A Boutonniere Deformity. This is the most common type of deformity in patients with rheumatoid arthritis. A rheumatoid thumb can make basic tasks of daily living, such as opening doors, writing, gripping, and typing infinitely more difficult, if not impossible, to execute. At the point that activities of daily life are compromised, medical intervention is necessary. As a nonsurgical option, Prolotherapy is an injection technique that is designed to stimulate the repair and regrowth of injured ligaments and tendons. It is gaining in popularity as a method to stabilize loose or lax joints, including the sacroiliac joint.12 This is the first clinical report of a thumb boutonniere deformity with a subluxed interphalangeal (IP) joint that was stabilized using a splint and Prolotherapy. With a six-year history of rheumatoid arthritis, a 57-year-old, left-handed female required the use of anti-rheumatic drugs for several years to relieve symptoms. For the past six months, however, she had been off of all medications, controlling her rheumatoid arthritis with diet, exercise, and other lifestyle modifications. She worked as a real estate agent and the thumb deformity was giving her almost constant pain, level 7 (0 to 10 scale) with activity, as well as decreased grip and pinch strength. Due to disruptive thumb pain, weakness, and deformity, the patient scheduled a Prolotherapy consultation with hopes for an alternative treatment. Figure 2. Patient with a 35-degree IP left thumb joint deformity. Figure 3. Correcting the IP joint with three-point pressure. Prior to her first Prolotherapy treatment, the patient was advised to get a custom splint and wear it continuously for six weeks, during which time she would receive three Prolotherapy treatments. Figure 4. 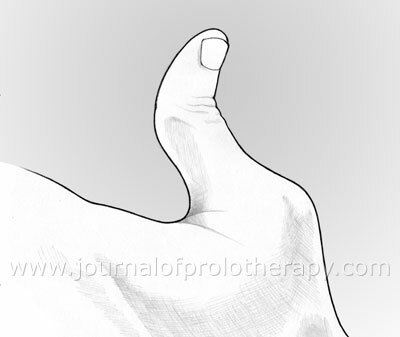 Prolotherapy to the IP joint of the thumb. Figure 5. Left thumb swelling at IP joint two weeks after first Prolotherapy treatment. Note: pressure excoriation from swollen IP joint rubbing on splint band. The patient was instructed not use the splint for two weeks and have an occupational therapist re-adjust the splint to allow for the swelling that occurs with Prolotherapy. Figure 6. The custom volar digital gutter splint made by the occupational therapist to allow for the swelling that accompanies Prolotherapy treatment. Figure 7. IP joint deviation improved to ten degrees. The digit deformity follows the mechanical changes. The MP flexion deformity results from the displaced EPL, which bypasses the MCP joint and applies its power instead to the distal phalanx. Then, the collateral ligaments elongate and the MCP joint subluxes. • The existence of deformity is not necessarily an indication of the need for surgery. • Tailor the surgical plan to the individual patient. • Do the uncomplicated procedures with the best chance of success first. • Prophylactic surgery does not stop the progression of the disease. • Do not try to do too much at once. • Be realistic with your patients and yourself with regard to what can be achieved. As for the patient’s wishes, she adamantly rejected surgery. She had worked to control her rheumatoid arthritis with such lifestyle modifications as diet and herbal remedies. She had been off anti-rheumatic drugs, including Humira®, for six months prior to her first consultation. On the initial examination, her boutonniere deformity and IP subluxation were clearly reducible, which made joint stability with Prolotherapy and splinting good treatment options. After this patient’s initial Prolotherapy treatment, the swelling created friction with the splint, which could not accommodate the increased size of the joint. For this reason, the patient was without the splint for two weeks, and another splint had to be made to accommodate the swelling. Once the second splint was fitted, bi-weekly Prolotherapy treatments continued for three sessions. Over the course of treatment, the patient’s thumb was immobilized for six weeks. This was sufficient time to allow the collateral ligaments to tighten and correct the IP subluxation. In cases of a severe hand or thumb affliction known as boutonniere’s deformity, surgery, such as arthroplasty or fusion, is the preferred treatment. When the patient refused the surgical option, her 35-degree IP subluxation was treated instead with a combination of Prolotherapy and splinting. The patient agreed to wear a custom three-point splint without removal and complete three sessions of comprehensive Prolotherapy injections over a six-week period. The Prolotherapy solution was boosted with sodium morrhuate, which accelerates the inflammatory healing process. To allow for the swelling that accompanies Prolotherapy treatment, the splint was designed with an adjustable strap. After a program of splinting and Prolotherapy, the deformity was reduced from 35 to 10 degrees, presumably the result of shortened and strengthened ulnar side IP collateral ligaments. While surgery is still the dominant treatment for digital IP joint deviations, this case documents Prolotherapy as an effective alternative for severe IP deformities. 1 Alamanos Y. Incidence and prevalence of rheumatoid arthritis, based on the 1987 American College of Rheumatology criteria: a systematic review. Semin Arthrits Rheum. 2006;36(3):182-8. 2 Chacko A. The rheumatoid thumb. Hand Clin. 2008;24:307-314. 3 Nalebuff EA. Surgical treatment of tendon rupture in the rheumatoid hand. Surg Clin North Am.1969;49;811-822. 4 Oetgen M. Non-operative treatment of common finger injuries. Curr Rev Musculoskelet Med. 2008;June1(2):97-102. 5 Wolock BS. Arthritis of the basal joint of the thumb: a critical analysis of treatment options. J Arthroplasty. 1989;4:65. 6 Matullo K. CMC arthoplasty of the thumb: a review. American Association for Hand Surgery. 2007December;2(4):232-239. 7 O’Brien ET. Surgical principles and planning for the rheumatoid hand and wrist. Clinics in Plastic Surgery. 1996;23:407-420. 8 Berger B. Arthroplasty in the hand and wrist. In: Green, DP, Hotchkiss RN, Pederson WC, Wolfe SW editors. Green’s operative hand surgery. 5th ed. Amsterdam: Elsevier: 2007. 9 Armstrong AL. The prevalence of degenerative arthritis of the base of the thumb is post menopausal women. J Hand Surg Br. 1994;19(3):340-1. 10 Barron OA. Basal joint arthritis of the thumb. JAAOS. 2000;8(5):314-23. 11 Barnes PM, et al. CDC National Health. Complementary and Alternative Medicine Use Among Adults and Children; United States 2007. December 2008. 12 Distel L. Prolotherapy: a clinical review of its role in treating chronic musculoskeletal Pain. PM & R: the journal of injury, function, and rehabilitation. June 2011;6:S78-S81. 13 Nalebuff EA. Diagnosis, classification and management of rheumatoid thumb deformities. Bulletin of Hospital Joint Diseases. 1968;29:119-137. 14 Chacko AT, Rozental TD. The rheumatoid hand. Hand Clinics. 2008;24:307-314. 15 Belcher HJCR. Thumb deformities. Available at: http://www.pncl.co.uk/~belcher/teaching/Rheumatoid%20thumb.pdf. Access date: 9/27/2011. 16 Millender LH, Nalebuff EA. Evaluation and treatment of early rheumatoid hand involvement. Orthopedic Clinics of North America. 1975;6:697-708. 17 Lister RG. Rheumatoid. In: Lister RG, ed. The Hand: Diagnosis and Indications. Third edition. New York, NY: Churchill Livingstone;1993. 18 Netter F. The Ciba Collection of Medical Illustations. Vol 8, Part II. Summit, NJ: Ciba-Geigy Corporation; 1990:222. 19 Souter WA. The problem of boutonniere deformity. Clinical Orthopedics. 1979;11:3-16. 20 Terrono A, Millender L, Nalebuff E. Boutonniere rheumatoid thumb deformity. Journal of Hand Surgery America. 1990;15:999-1003. 21 Butler D. Biomechanics of ligaments and tendons. Exercise and Sports Scientific Review. 1975;6:125-135. 22 Maynard J. Morphological and biochemical effects of sodium morrhuate on tendons. Journal of Orthopedic Research. 1985;3:236-248. 23 Hackett G. Joint stabilization: an experimental, histologic study with comments on the clinical application in ligament proliferation (Prolotherapy). American Journal of Surgery. 1955;89:968-973. 24 Liu Y. An in situ study of the influence of sclerosing solution in rabbit medial collateral ligaments and its junction strength. Connective Tissue Research. 1983;2:95-102. 25 Reeves K. Prolotherapy: present and future applications in soft-tissue pain and disability. Physical Medicine and Rehabilitation Clinics of North America. 1995;6:917-925. 26 Reeves K, Hassanein K. Randomized, prospective, placebo-controlled double-blind study of dextrose Prolotherapy for knee osteoarthritis with or without ACL laxity. Alternative Therapies. 2000;6:68-79. 27 Reeves K, Hassanein K. Randomized, prospective, placebo-controlled double-blind study of dextrose Prolotherapy for osteoarthritic thumb and finger joints: evidence of clinical efficacy. Journal of Alternative and Complementary Medicine. 2000;6:311-320. 28 Steultjens EM, Dekker J. Occupational therapy for rheumatoid arthritis: a systematic review. Arthritis and Rheumatism. 2002;47:672-685. 29 Steuljens E, Dekker J. Occupational therapy for rheumatoid arthritis. Cochrane Database of Systematic Reviews 2004, Issue 1. Art. No: CD003114. DOI: 10.1002/14651858.CD003114.pub2. 30 Ruby LK, Cassidy C. Hand clinics: Rheumatoid Arthritis of the Hand and Wrist. Vol 12 No. 3. Philadelphia, PA: W.B. Saunders Company, 1996.